Being that there really isn't anything I need to do to the Formula this winter, I've brought home something to tinker with this winter! The thing that motivated me to pick this up happened to a friend of mine a few years ago. 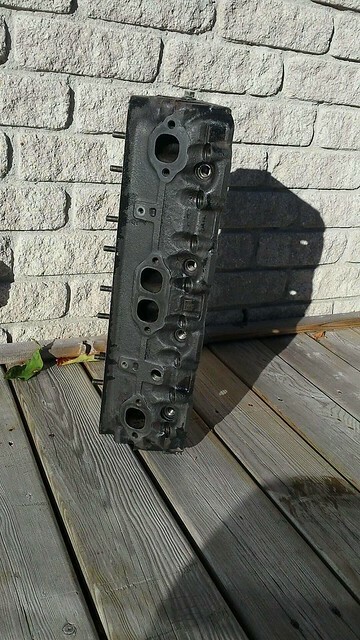 While driving along the 400 in his 69 Camaro, an exhaust valve decided its shift was over & parted company turning the entire short block into a pan full of marbles in an instant. 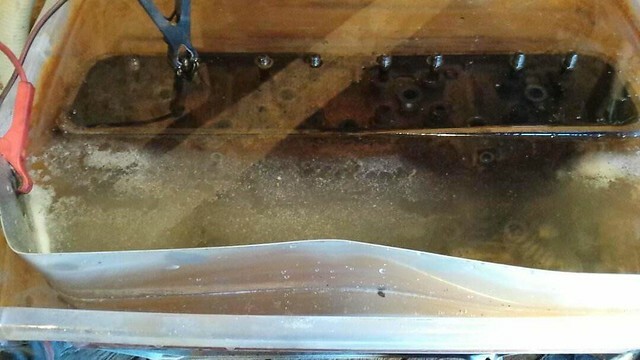 Subsequently his car was parked for the majority of 2 years while he acquired parts to build a new mill, assemble it, and finally put it in the car. Granted his new mill is a BIG improvement over the old one, but the loss of the use of his car for a couple years was frustrating. 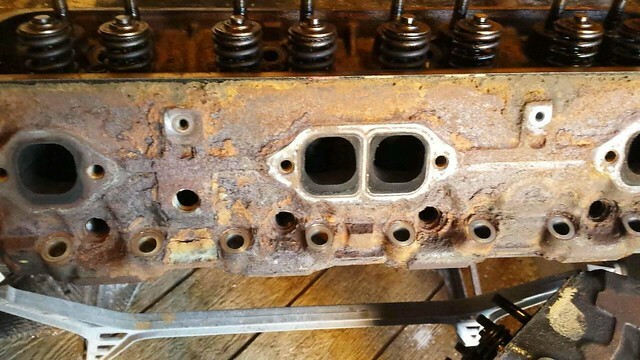 The thought went through my mind that something similar could just as easily happen to me, so given how plentiful small block Chevys are and how relatively inexpensive they can be had........why not pick one up, tear it down, go through it and have a spare short block ready to go in case I (or one of my many friends with sbc equipped classic cars) needs one all of a sudden!! After watching Kijiji for quite some time I found the one I felt would be the best candidate for me. 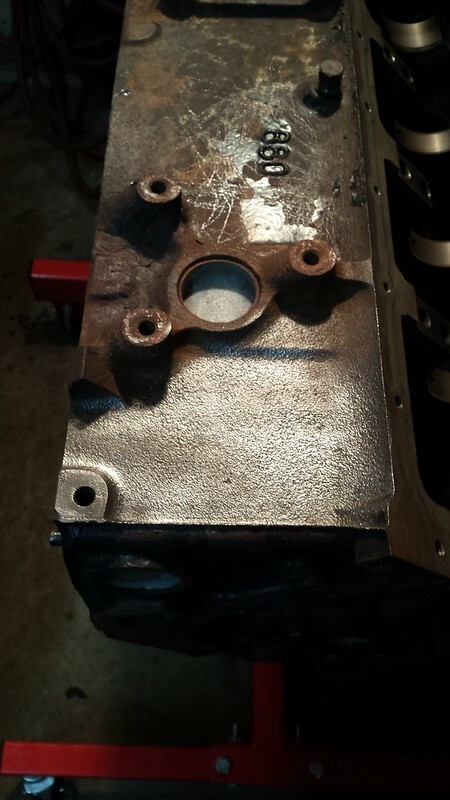 Its a 350 Vortec from a 2000 Express van that had low mileage. 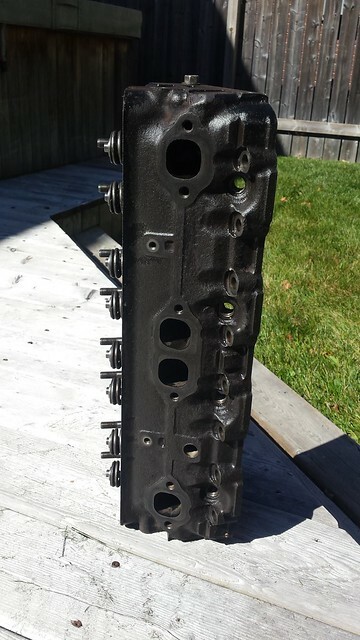 That means its a 1 piece rear main seal, hydraulic roller cam block topped off with Vortec heads (906 castings on this one). So I struck a deal and brought it home last weekend. My initial inspection would lead to believe I got lucky and this one is closer to being a gem! 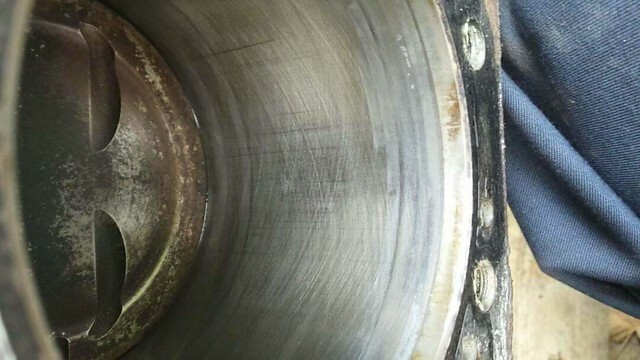 Cross hatch marks are clearly visible in all cylinders.....there isn`t even a ridge at the top of the cylinder. Wear appears to be almost non existent! God only knows what I`ll find when I pull all the caps to check the bearings, but at this point it looks like it is worth putting it up on a stand and tearing it down completely Looks like I got lucky and have something to do this winter! Until I get the short block up on a stand I really can't progress with that any further, however given that the heads are off I can certainly give them some much needed love. As great as a set of Vortecs would be, I've made the decision that I'll likely sell these off once I've finished giving them a once over. 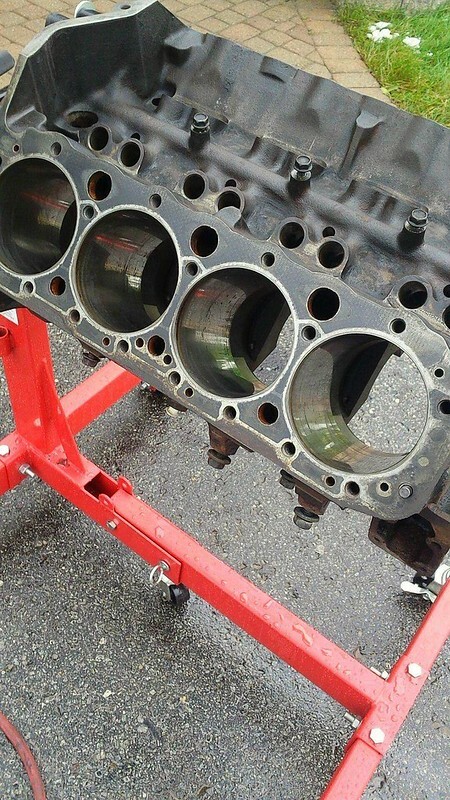 Vortecs would require a different intake manifold and after the amount of time I put into porting my current one, I don't forsee that happening. Realistically I wouldn't expect a significant performance difference between my fully ported 083's and a set of stock Vortec anyways. Nobody is going to buy these things for any reasonable price looking like this though!!! After stripping them down, into the electrolysis tank they went! After cooking for 5-6 hours I pulled it out to check on the progress. Rust was just melting away, so I left it in overnight to give it a thorough clean up! 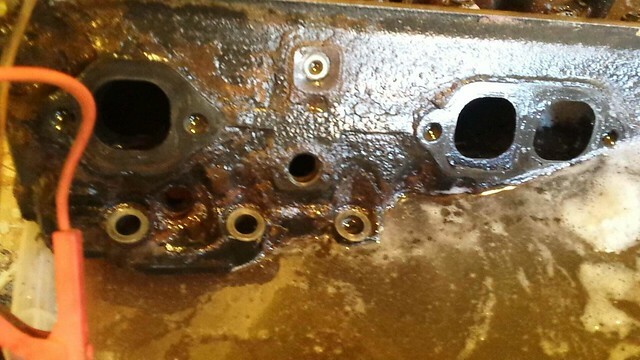 After I pulled it out this morning, hosed it off and gave it a good scrubbing down it looks like something you would actual consider installing on a motor now! 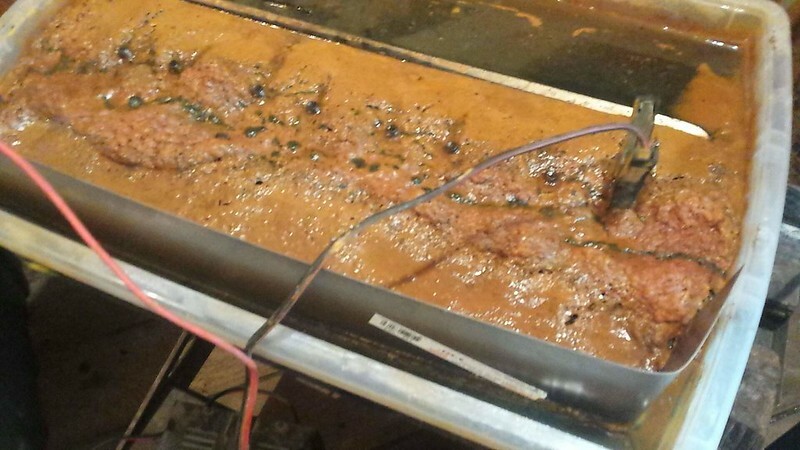 Who knew that a solution of steaming hot water & Pinesol is the hot ticket for removing baked on oil residue? 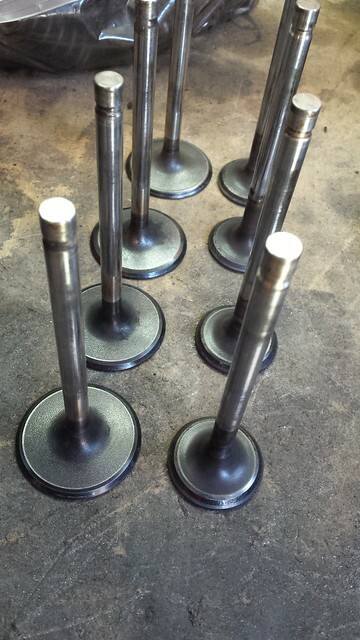 Valves all cleaned up ready to get lapped in. If I had known that Vortec valves come from the factory back cut, I'd have popped for a set when I put my ported 083's together! 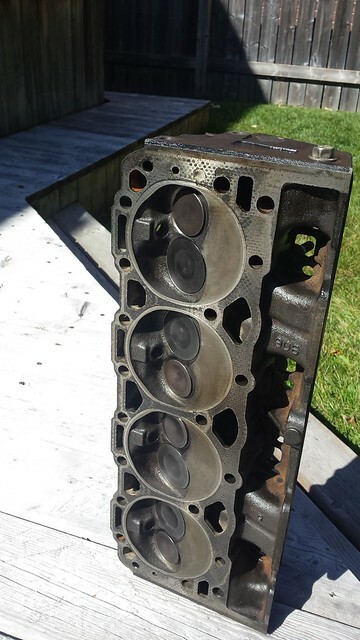 On a side note regarding the valves, I was amazed that there is ZERO play in the guides in these heads.....another sign of the minimal/non existent wear this engine has. And finally all cleaned, valves lapped, & re-assembled ready to go. On to the second head this week! 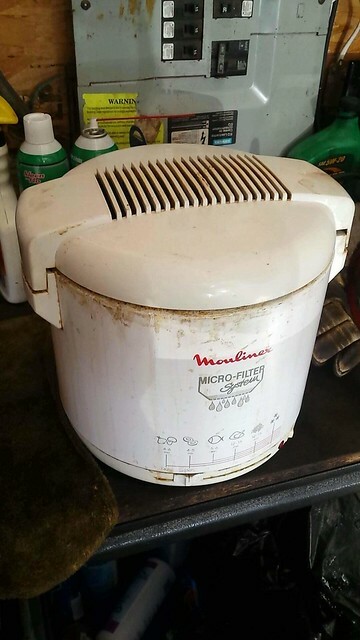 After rummaging around in the basement I found our old deep fryer that we haven't used in probably 10+ years. As an experiment I filled it with a Pinesol/water solution, turned it on and brought it up to a boil. 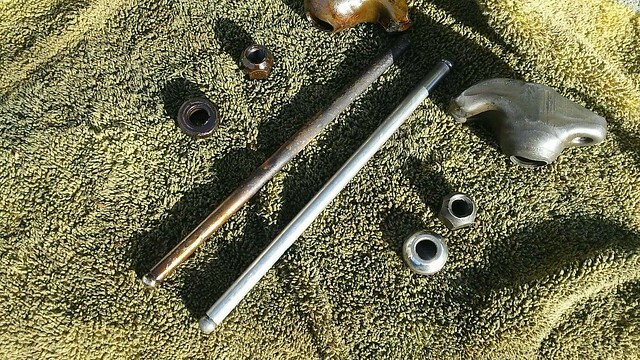 Once things were cooking well I dropped in all the pushrods, rocker arms, pivot balls & nuts to see what would happen. 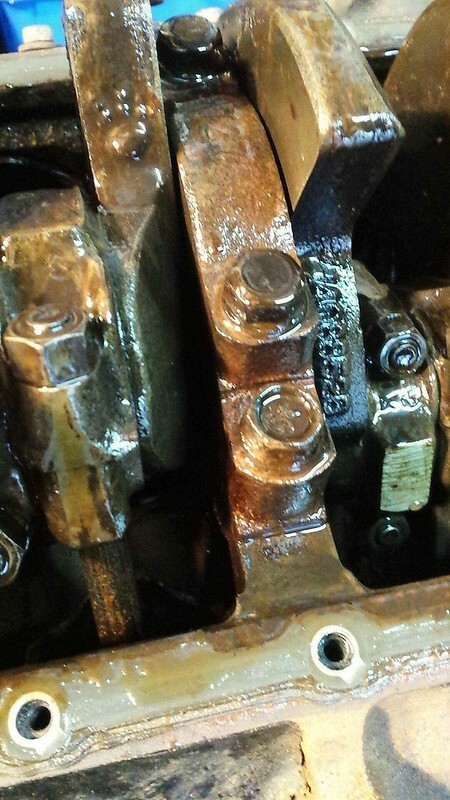 Within about 5 mins of being in the boiling solution I grabbed a pushrod out with a pair of pliers and was amazed to find out that the heavy oil residue/sludge wiped off with zero effort whatsoever leaving behind a virtually new looking part!! I left the remaining parts in for about 10 mins, then started pulling them out piece by piece and wiping them off.......the difference is remarkable & with virtually no labour at all on my part! Untouched parts on the left, cleaned parts on the right. Even my wife is happy about this most recent discovery as the garage now has a nice pleasant pine fragrance! Yes......figuring out ways to accomplish what I need to do without involving any labour on my part pleases me! Well this is definitely not what I expected to be the time consuming part so far! After spending probably 45 mins just getting the lifters out of the block, I was overjoyed to find all 16 of them stuck! I initially just thought I'd replace them all but after looking on RockAuto and finding they're about $10 each US X 16, that adds up, so I figured it was worth a shot tearing them down to see what I could do. Its been taking about 15 minutes a piece to disassemble, fully clean up, & re-assemble each one. 16 is gonna take a while!!! Head # 2 is cooking......a lot of nastiness coming off!! 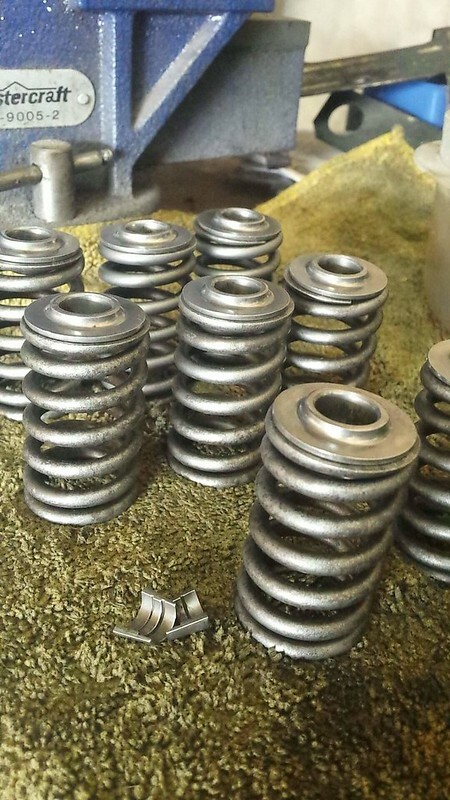 Springs/retainers ready to get re-installed. 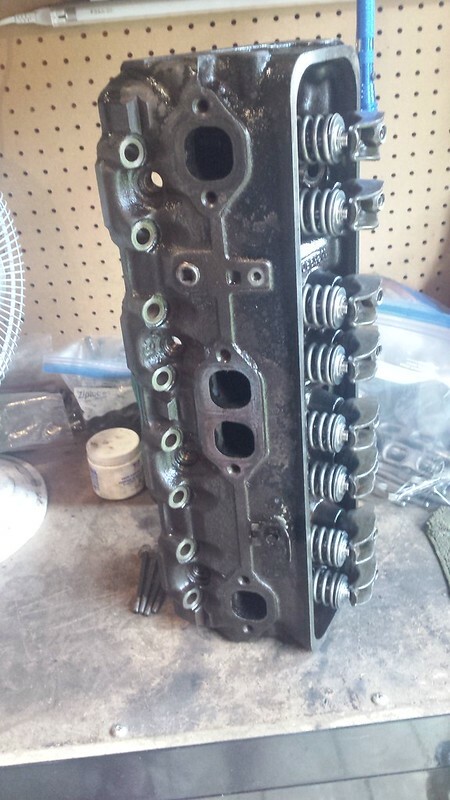 Hopefully should have this head fully cleaned up, valves lapped in and ready to be sold tomorrow! Second head assembled and ready to sell. Progress is still happening though. 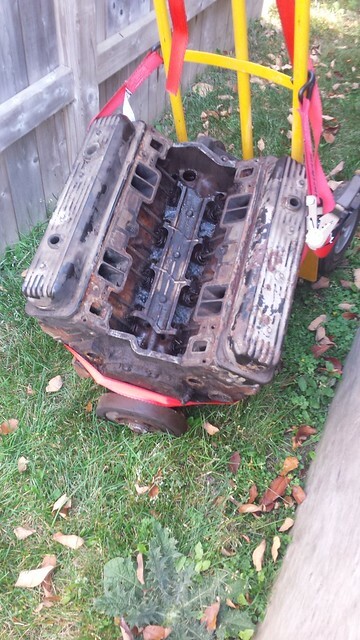 Scored a smokin' deal on a new engine stand to put the short block up on hopefully this weekend. I am really pleased with how compact it folds up to when not in use. 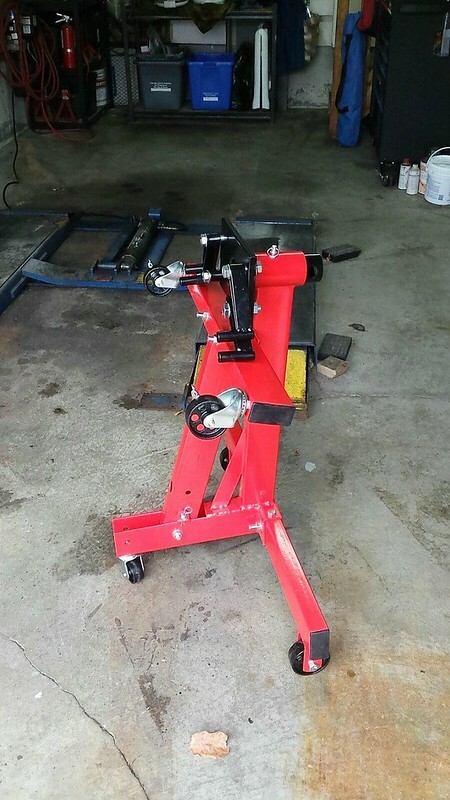 I guess after working on cars for almost 30 years it was time to invest in a stand of my own!!! Got some time to get the motor out of the back yard up on the stand today & curiosity got the best of me so off the pan came! I was fully expecting to find 2 bolt mains, but am definitely not disappointed to find 4 bolt mains........this purchase is getting better and better!! A lot of sludge to clean out of this thing.......that part is gonna take an eternity, but everything so far is indicating that it will be time well spent! So before I tear this thing down completely I wanted to spend some time getting full specs on a handful of cams I have here. As with anything else the info on the internet is of limited help. I found the usual duration @ .050", lift, and lobe separation, but came up empty regarding intake centerlines & advertised durations, so the solution is to measure them myself. Given that I wasn't able to find these specs I figured I'd share the specs I actually measured. Last edited by auto_god on Mon Dec 11, 2017 7:53 am, edited 1 time in total. Finally got it completely stripped down and cleaned......now for the tedious task of measuring everything. Once I have all the measurements in front of me I'll decide on what I'm going to do with this mill.......I have a couple of options going through my mind! 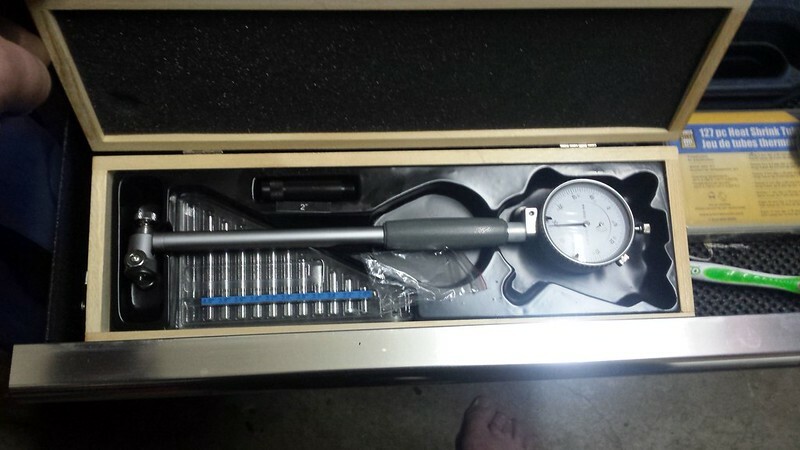 When I got home Friday night my new bore gauge was waiting on the door step! To me it made sense to buy the tool to check the block over fully before sinking any significant amount of $$ into it. Having a new toy I naturally had to go out to the garage and play with it. I was dead tired so I only put the gauge in a couple of cylinders but my measurements so far have me super pleased. 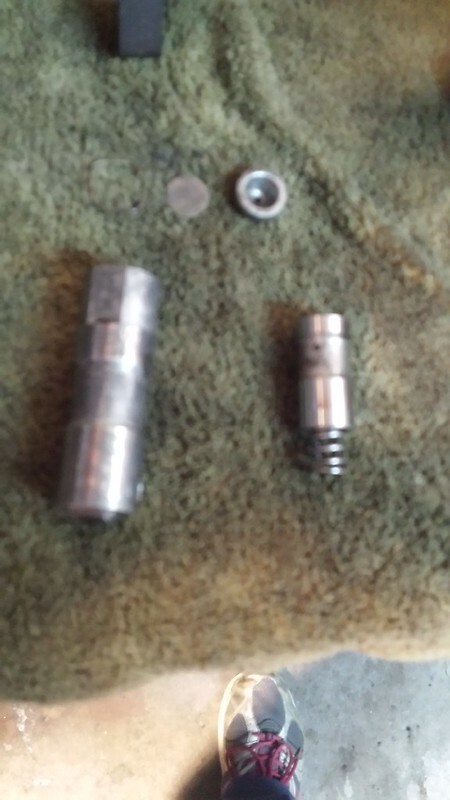 Out of round checked in at 0 to .0005", taper checked in at .001" and bore diameter came in at 4.002". Wear appears so far to be very minimal. Actually about the only thing I've measured so far that hasn't been well within service limits has been the ring gap. 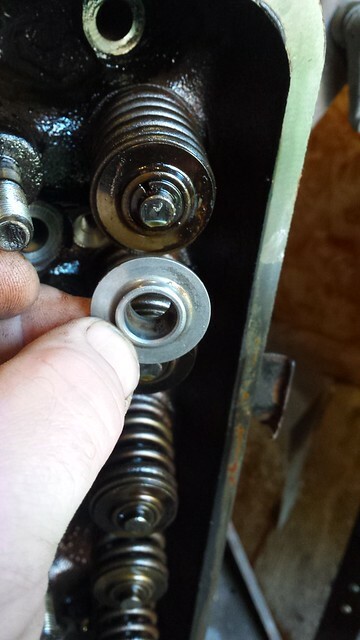 I stuck 1 top ring in a cylinder and it was .005" beyond the service limit. 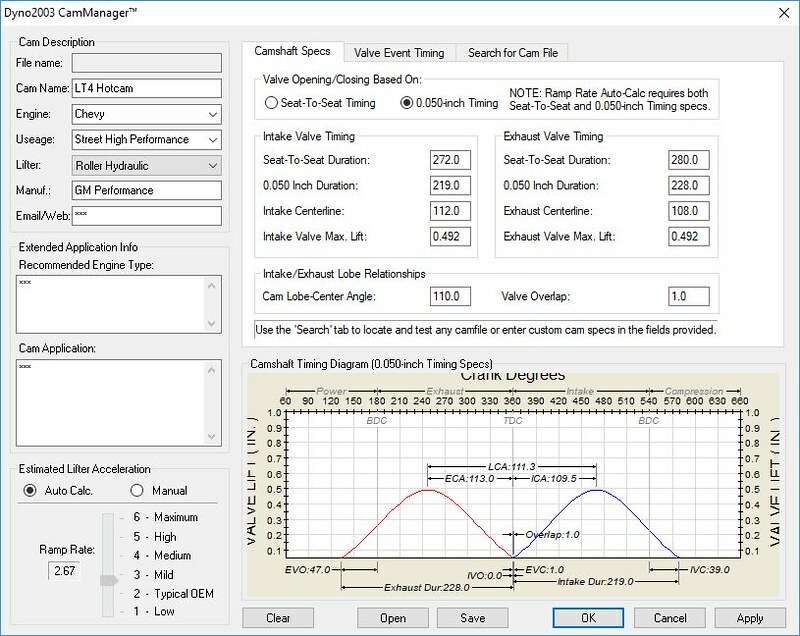 Hopefully nothing will demand my time Monday and I can spend a few hours taking complete, detailed measurements of all the cylinders, bearings, etc. Soooo.....at this point its looking like a quick hone, some rings, bearings and gaskets should have this mill ready to run as a back-up to my current one for likely a couple hundred bucks. ^^ that is very intriguing!! Well the unthinkable has happened! 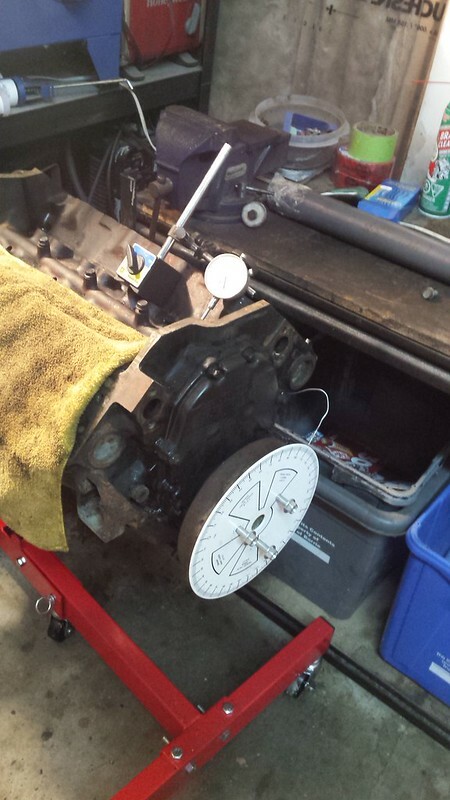 After spending 2+ hours taking measurements today compiling a huge spreadsheet of specs, it seems that I've purchased a used motor off Kijiji for peanuts that requires absolutely no machine work whatsoever. Time to clean it up and make it pretty, then order some parts and start re-assembling! Started cleaning the block up on the outside tonight.....looks like it should clean up well!